Atelier Big City + FSA Architecture + L'O.E.U.F. Since 2000, Phyllis Lambert has accepted twice to be juror of a competition for a library in Quebec, the first one in 2000 for the Grande Bibliothèque du Québec, and the second time in 2013 for the expansion of the Pierrefonds Library, at the periphery of Montreal. The GBQ was the beginning of a rich legacy of library competitions in Quebec, as Quebec has organized close to 15 library competitions since. The Quebec population is now in an ideal position to solicit a public debate about quality and innovation in this domain. 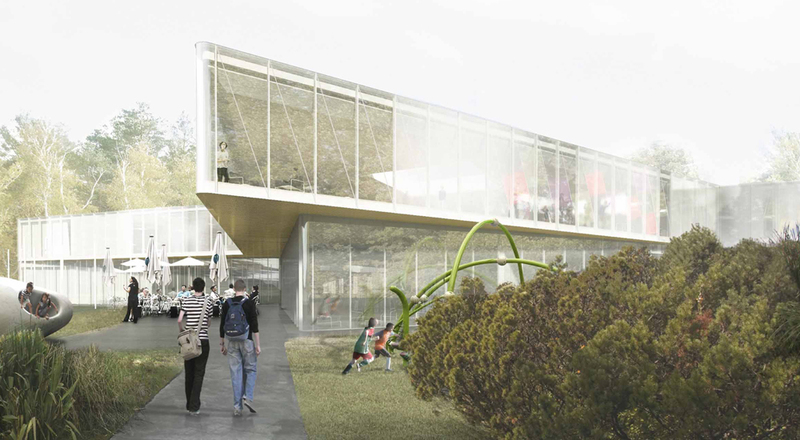 In the case of the Pierrefonds Library competition, which had a budget of under 20M$, it was not only about designing a library, but equally to integrate to an existing building, restructure the urban form, while valorizing the surrounding park. In some ways, it was analogous to the new Saint-Laurent Library competition of 2009 where competitors were required to "design an urban landmark". Both libraries situated at the periphery of the Montreal city center. Both had to valorize the surrounding green space. But the fundamental difference was that for Pierrefonds, a historical library from the 1980's had to be repurposed, bringing with this its share of constraints and opportunities. Consequently, the firm Chevalier Morales Architectes participated in both competitions, winning the Pierrefonds Library competition. As in most competitions today, sustainability was an important criterion however the stakes were not only focused on the general characteristics of the building construction, but rather on the local - the local richness of the site as a place of abundant resources, a project that can stimulate local citizen engagement and activity, and the local cultural development that such a place could engender in terms of creativity and knowledge. In other words, competitors were asked to think of the library as an ecosystem. (4) Chevalier Morales Architectes + DMA architects. Atelier Big City + FSA Architecture + L'O.E.U.F. chose to resolve the majority of the library on one floor and included a rhythmic series of skylights and courtyards. This frank and bold decision provided an effective connection to the surrounding garden, however, in the eyes of the jury, of which Jacques Plante was president, it presented the schema with a series of challenges in terms of access and control of entrances: crucial questions of security for a library. The fact that complementary services were located in the only vertical element in the form of a tower was not convincing in the end. The BGLA + Coarchitecture proposal gathered a series of classic tectonic devices, almost literally interpreted. The intricate brickwork, which constitutes the majority of the project's materiality, covers the entire form. Surprisingly included is a large hearth in the main space (Semperian ? ), perhaps pushing the metaphor of a 'home away from home' too far. The modernist flavour of the project by Dan Hanganu + Groupe A. focused on an entirely different element. Hanganu, in a lyrical voice, did not hide from a certain admiration for the existing building designed in the 1980's by one of his former mentors A. Vescei member of team Rosen Caruso Vescei + Gagnier Gagnon. The oral presentation dedicated a large part to the virtues of the existing, leaving far too little room to explain the new project: a tension between the old and the new somehow failed in conveying a clear project. This confusion was unlike the extreme pedagogical clarity of the presentation for the project offered by the winning team of Chevalier Morales Architectes + DMA architects during the public presentations. Even if at first glance, we may have thought that the irregularity of the star-shaped composition could have been seen too complex in that it could not be explained in a simple elevation or perspective. This was not the case since, when the architects explained their project during the public presentations, they started by contextualizing the larger urban space considering Pierrefonds in the greater Montreal picture, zooming progressively, from the local structure, to the park and its components, as well as to the accesses, carefully focusing on the architectonic details and aesthetics of their proposal. The jury unanimously recognized the degree of innovation on many levels - the bold yet convincing form in a hybrid context of the park and the existing building, the integrative approach to design, and their typically nuanced attention to context which models the project from the outside in order to liberate the interior spaces. The culminating point of their approach: an aesthetic of the whiteness focusing on the slightest variations of light. The Pierrefonds-Roxboro borough launched a design competition in 2013 for the expansion and redevelopment of Pierrefonds Public Library in a bid to improve existing library services as well as offer new services to the rapidly expanding local population. This is a new type of library, focused on various essential activities and encouraging the actions and contact between users, documents and media. The library becomes an ecosystem, a means to live and work together. The citizen takes on an active learning role in this context, following a "do it yourself" philosophy that enables him to take an active part in his own development as well as his community's by doing things. The library's renewal as an informational and cultural hub within the community will make it a vector for sustainable local development. The library is part of a greater plan to stimulate citizen activity, becoming the heart and soul of the neighbourhood. - Give the public access to services, information, resources and spaces, encouraging community empowerment.